One of the most important characteristics of Ngabes is its culture and, of these, probably the most prominent and well-known is his handicraft. 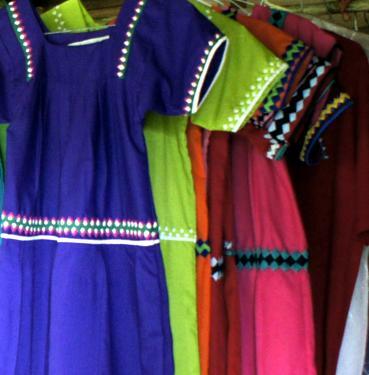 Their spacious and colorful traditional dresses, made with lightweight fabrics and ornaments of their culture, are called NAGUAS, and is very common to see their women, "Meri Ngabe", wearing those dresses wherever they go. No less attractive are the CHACARAS or MOCHILAS, bags made of natural a fiber, the PITA, embellished with natural dyes from plants, leaves and flowers. Other elements that stand out are the CHAQUIRAS or necklaces, as well as the bracelets. Although to make them use plastic beads strung on nylon lines, the result, based on geometric designs and colors, is amazing and their artwork is very popular among the "chui" (no Ngabes).